ABB technology transforms India’s traditional transport into a clean energy solution from end-to-end. But these vehicles, vital as they are, have become a major problem in India’s congested cities. 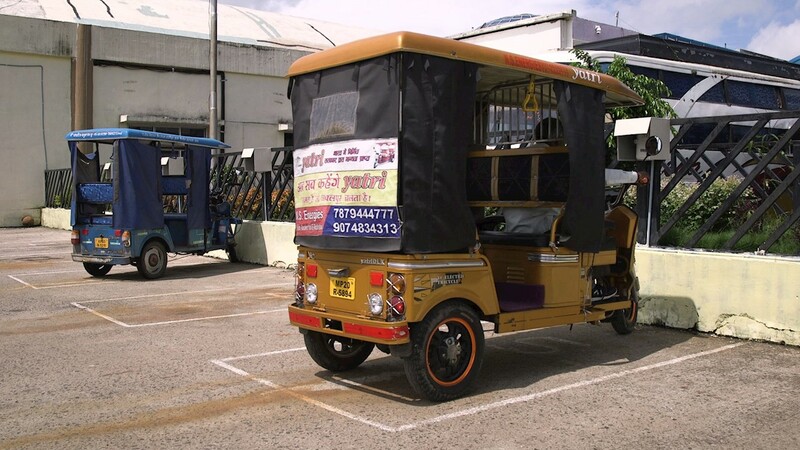 Long known throughout Asia as tuk-tuks, because of the sound associated with the early versions’ two-stroke gasoline engines, the noisy petrol-burning auto-rickshaws add to the urban cacophony, spew air pollutants and disgorge climate-threatening greenhouse gases. That’s why transportation officials in Jabalpur, a central India city of nearly 1.6 million people, have encouraged the adoption of a new generation of quiet, zero-emission electric rickshaws. And to make the e-rickshaws viable, the city has engaged with ABB to help create a network of solar-powered charging stations. “We appreciate this government initiative,’’ says ABB’s Santosh Belekar. “This is a trend-setter, I would say, in any smart city." Jabalpur in one of more than a hundred municipalities in the country the national government has identified as a “smart city.” That means, among other things, that Jabalpur is committed to encouraging the country’s economic development and expansion of the country’s middle class without adding to carbon emissions that make Indian cities some of the world’s worst air polluters. As part of the smart-cities effort, the Indian government has set the goal of making every car, bus, truck and other mode of transport in the country an electric vehicle by 2030. E-rickshaws, introduced in India in 2008, can do their part by providing an emissions-free, noiseless mode of transport. The battery-operated vehicles, have already replaced leg-powered cycle-rickshaws in most areas. But they are only slowly gaining grown on petrol-burning auto-rickshaws. One reason for the slow adoption is that e-rickshaw owners must usually rely on charging the batteries overnight at home, plugging into the utility grid. That can be relatively expensive in a country where per-capita income is below $2,000 a year. And it means using electricity that in most cases is generated from conventional, carbon-emitting energy sources like coal. The lack of affordable, publicly accessible charging stations has been a barrier to more widespread adoption of e-rickshaws. 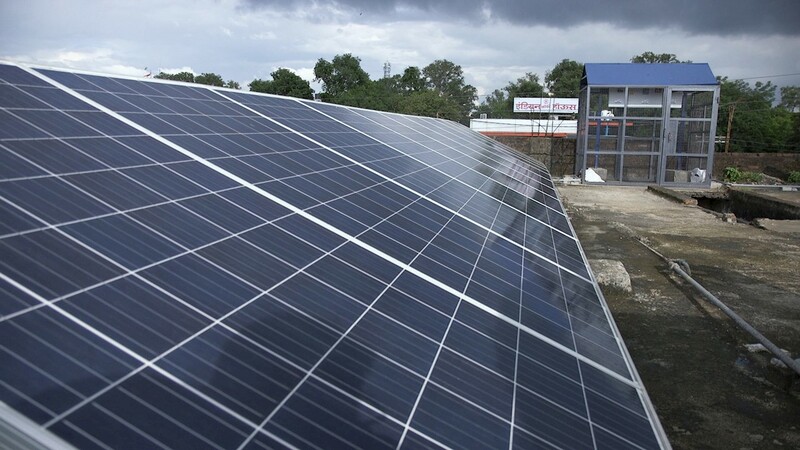 Under the pilot project in Jabalpur, local authorities plan to set up nine solar-powered charging stations to be used by the 400 or so licensed e-rickshaw owners in the city. The first station came online six months ago. The others, are scheduled to be up and running next year. “Only once we have this infrastructure in place can we make a case for people to migrate to electric,’’ said Sachin Vishwakarma, CEO of Jabalpur City Transport Services, the agency that is overseeing the charging stations. ABB supplies a critical technology for the charging stations: the solar inverters. As the sun hits the solar panels, generating direct current (DC) energy, the inverters convert that power to the alternating current (AC) used for the chargers. The charging stations, capable of generating 50 kilowatts of electricity, can serve as many as four WHAT e-rickshaws simultaneously. The sessions take between 7 to 8 hours for a full recharge, enabling the vehicle to travel 100 to 150 kilometers. The rickshaw owner’s price for recharging from the grid would be 40 to 50 Indian rupees (about 60 to 77 U.S. cents), compared with 30 rupees (46 cents) from the solar charging station, according to Vishwakarma. It can be a crucial difference to rickshaw drivers like Vijay Soni. Mr. Soni, 54, pedaled a cycle rickshaw for 30 years, then drove a petrol-powered rickshaw for an additional four years. This past February, he bought an e-rickshaw, under a government-subsidized program, and has been happily – and quietly -- driving about Jabalpur ever since. Even when he charges the vehicle at home, he said, the electric vehicle has lower operating and maintenance costs than his petro rickshaw did. Just as crucial is the potential savings in petrol and carbon emissions. Currently, some 5,000 petrol rickshaws are still operating in Jabalpur, burning through 20,000 litres of fuel a day. That’s 46 tonnes of CO2 that would be removed from circulation every day by upgrading those vehicles to e-rickshaws. Multiply that by the quarter-million auto-rickshaws now operating throughout India, and the country could avoid more than 2 million tonnes of carbon emissions a day by converting to electric rickshaws. This content is part of a series on sustainability topics that ABB is producing for the COP 23 climate conference. ABB is proud to support global efforts to address climate change. Visit our special COP23 / sustainability website for more information.